The first VFL Night Series ran from 1956 to 1971 and was brought to an end by dwindling crowds and the League's move to a Final Five. It seems hard to believe in today's multimedia world but matches in those series at Lake Oval were not televised. It took the strong ratings and advertising revenue generated by the 1976 NFL Wills Cup to finally alert football administrators to the potential benefits of football broadcast live on network television. 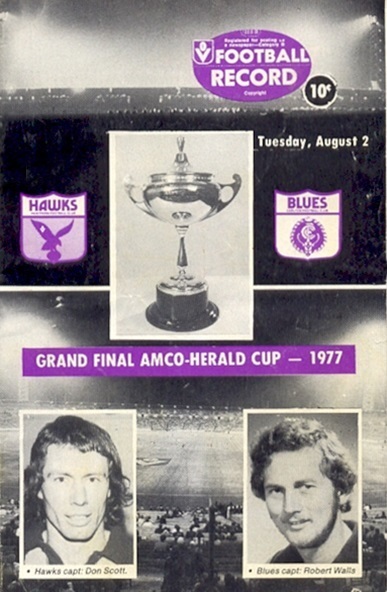 However, the NFL's plans for 1977 were thrown into disarray when the VFL announced they were withdrawing from the national competition to form their own rival night series, the Amco-Herald Cup. The series would be based at the League's headquarters, VFL Park with new light towers constructed specifically for the event at a cost of a million dollars. Live telecasts of the rival competitions went head-to-head from 7:30pm each Tuesday night with the VFL series broadcast nationally on the Seven network and the NFL series on the ATV-0 network. The original VFL night series had been a consolation tournament featuring only the eight teams that missed the VFL finals* and played in September/October. In contrast, the 1977 series featured all 12 clubs and was played mid-week throughout the VFL premiership season. A twelve-team competition meant only six teams would advance to the quarter finals instead of the required eight so a 'lucky-loser' system was adopted. This resulted in the two defeated teams from Round 1 with the highest percentage also advancing to the quarter-finals. From that stage onward all matches were played on a knockout basis. *Yellow is the new white - ever since ﻿the first matches were played under lights in 1879﻿, a white football had been the norm for night play. The 1977 VFL Night Series was the first to use a yellow football and, although the rival NFL series continued to use a white ball until at least 1978, yellow quickly became the standard for night matches Australia-wide. *Lake Oval's last hurrah - construction delays meant the $1 million light towers at VFL Park were not ready for the series-opener on May 3rd. Rather than postpone their heavily-promoted new series, the League transferred the Richmond-Collingwood (May 3) and Carlton-St Kilda (May 10) matches to Lake Oval in South Melbourne, the former home of the VFL Night Premiership from 1956 to 1971 and the only other venue in Melbourne with lighting up to television broadcast standards. *Lights out - on May 17th the first night match to be played at VFL Park was delayed by 55 minutes due to a massive power failure. At 7:20pm a fuse blew in an S.E.C. feeder pole in nearby Wellington Road, cutting a third of the power to the stadium's new lighting system. Five minutes after the scheduled start time of 7:50pm restless fans started jeering and slow-clapping, leading to an announcement over the public address system asking fans to be patient. *Fitzroy fined for wrong shorts - The Lions were officially the away team for their opening match of the series but wore their home shorts, causing a colour clash with North Melbourne who also took to the field in royal blue shorts. 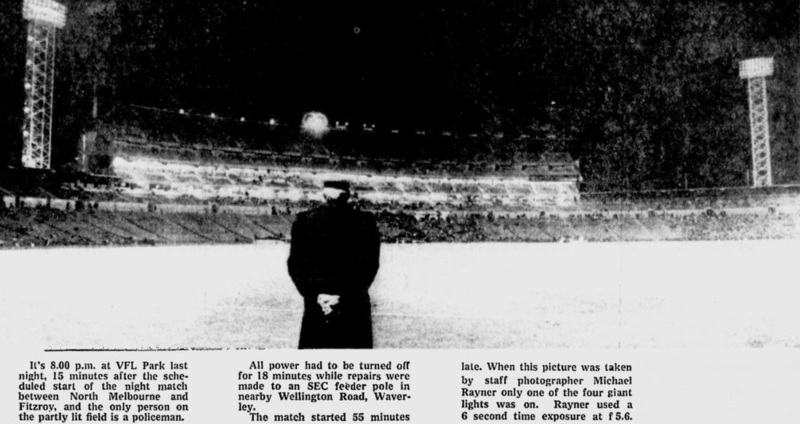 *Frozen Cats and Hawks - the Geelong-Hawthorn match on May 31st was played in constant rain and freezing winds on Melbourne’s coldest day in 81 years. Geelong's Kevin Sheehan reportedly tried to call out for the ball during the second half only to realise his jaw had locked due to the cold. *Lights out, again! - During the curtain-raiser played before the Carlton-Melbourne match on July 5th a ten-minute blackout occurred causing the match to be shortened. VFL officials feared another power failure like that of May 17th had occurred. *The 'Flying Doormat' goes berserk - Carlton's Bruce Doull was known as an unflappable defender who had calmly and consistently shut-down opposition forwards throughout the 1970s. That all changed when Hawthorn's Kevin Ablett ripped off Doull's trademark elastic headband and ran away with it in the 1977 night series Grand Final. The normally emotionless Doull went ballistic, charging after Ablett and swinging punches wildly. It took six seasons until an opponent was game enough to try it again, with cheeky Essendon rover Tony Buhagiar stealing the headband during the 1983 VFL Elimination Final and throwing it into the crowd. This time a better-prepared Doull called his opponent's bluff, calmly reaching into his sock and producing another headband, much to the amusement of teammates and opponents alike. Unless otherwise noted the information was sourced from the Football Record. This match was originally scheduled to be played at VFL Park but was moved because the light towers were not completed. The first night match to be played at VFL Park. The game was delayed 55 minutes due to a power failure and commenced at 8:45pm. 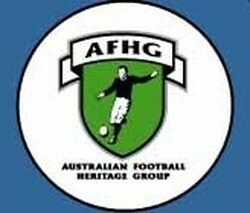 Fitzroy were fined $5000 ($250 per player) for wearing coloured shorts when they were officially the away team. Played in constant rain and freezing winds on Melbourne’s coldest day in 81 years. Geelong's Kevin Sheehan reportedly tried to call out for the ball during the second half only to realise his jaw had locked due to the cold. The Football Record lists only 14 of Carlton’s 15 goals, crediting Canfield with one goal instead of two. The Football Record lists only 3 of Richmond’s 4 goals, omitting one kicked by Cloke. The match was played in torrential rain.